While I didn't blog as much as I would have liked this past month, I did see and hear lots of great music. The Menomena show at the Echo was wonderful as was Elvis Perkins a few weeks later (at this point, I don't think they guy can do me wrong). I am officially obsessed with the new Andrew Bird. I also finally got around to listening to the new Albert Hammond solo project and actually bought The Replacements' "Let it Be" which is great too. 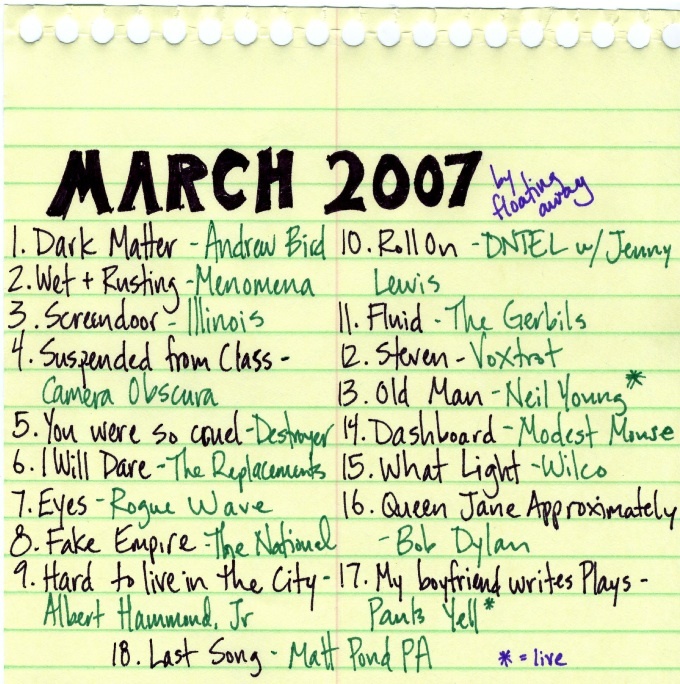 Throw in some new stuff (The National, Wilco, Voxtrot, Neil Young, DNTEL, Modest Mouse) and some classics (The Gerbils, Dylan, Camera Obscura, Destroyer) and you have my mix of the month. Enjoy. 9. Hard To Live In The City - Albert Hammond, Jr.
17. My Boyfriend Writes Plays - Pants Yell! These are great, Dan. Thanks for doing them. Woa with the anger about Keanu? I think he would not want his sighting to overshadow what was a great little ones performance. 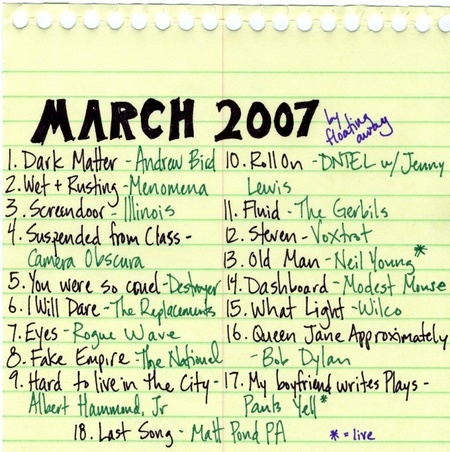 Yea for the March mix though. and I love the hand scibbled play list! Do you know rappelz rupees? if you play the online game, you will know rappelz gold is the game gold. In the game, if you had more buy rappelz rupees, you will had a tall level. But if you want to, you can come here and spend a little money to bought buy rappelz gold. Quickly come here. Thanks for your opinion. I am very lucky to get this tips from you. First-class blog. I absolutely understand what that you give to it. I do not unconditionally agree with everything you express however I do have a good time reading it. Please don't stop the excellent work. I will positively come back.